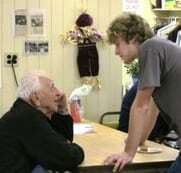 The proximity of the Cold Spring Senior Center to Haldane doesn’t translate into a great many shared activities. A lunchtime concert this week, performed by Haldane High School musicians broke bread, so to speak, on what is hoped will be increased interaction between two groups with so much to offer each other. A group of ten students, from grades 9-12, made the short trip around the corner and quickly set up sound equipment in the front of the room where seniors gather every weekday for a hot lunch. 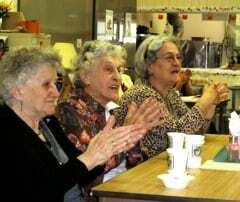 The center, run by the Putnam County Office for the Aging at the American Legion Hall on Cedar Street, draws an average of 50 local residents who visit regularly and enjoy not only the meals, but companionship, nutrition education, and health counseling. According to the Center’s Nutrition Site Manager, Annie Riesdorph, any kind of visit from young people is always looked forward to eagerly. “My people who got sick will be upset they missed this,” Riesdorph noted. Klubnick and Curto originally thought of doing a concert tailored to the residents of the Chestnut Street senior apartments, but there was no suitable inside space there, so after Curto did a little outreach to the Office for the Aging, the venue shifted to the Cedar Street facility, where an appreciative audience was all ears as the kids began their set. “Ain’t No Sunshine” was the first tune played in a program with songs from just about every decade from the 50’s on up. The musicians mixed it up with blues, a waltz, and even a little rock ‘n roll. Highlights included Matt Chason and Mr. Klubnick on “Kansas City,” Jessica Gore inviting the seniors to snap along to a bluesy “Fever,” Lindy Labriola and Chason putting an achy throb into “Hallelujah,” and a four-vocalist “You Are My Sunshine,” which got a “beautiful” shout out at the end from a nearby table. Introduced by Mr. Klubnick as “a little bit of rock and roll, hopefully not too loud,” the Christian Perkins vocal on “Blue Suede Shoes” garnered a “bravo” from a lady at the front. “Runaround Sue” was up next, with Mr. Klubnick announcing that “I’m absolutely sure everyone has heard this at least once.” During Lindy Labriola’s take on “Tennessee Waltz” one woman was so swept up in the 1-2-3 of it that she asked Kathy Curto to dance with her and they tripped the lights fantastic amidst the tables and chairs. 94-year-old Nancy Tompkins confided that she had known Mr. Klubnick for quite some time. “I haven’t heard him play before, but I’ve known his family for years and years.” She went on to share a bit of personal history, “I was born here, went to Haldane but left in the 8th grade — there were nine kids in my family and I had to go to work. I was a sewer, and then we went into the upholstery business.” So many tales to tell from 94 years in Cold Spring! Concert finished, Mr. Klubnick and the kids packed up and went back to the usual business of their day: teaching and being taught. Curto and Klubnick have visions of many more such occasions, with some possibly on a larger scale. As Curto noted, “because our culture is so fast paced and digital, it often feels like there is a great divide between these particular generations. Bringing them together is so important.” Klubnick was pleased with how well it all went. “This is exactly the way we wanted to put in together. It all depends on the right kids. For many of them at this age music is all about attitude. This group is positive, helpful and glad to be doing something for people in our community. It worked out really well. I was concerned about the volume, but it was perfect. Student Matt Chason enjoyed performing for the seniors. “It was fun, laid back, not a lot of pressure. You can be soft and confident with your voice. We were working as a unit.” Aside from those named, the other students involved were Finn Lovell (tech), James Rubino (guitar), Jack Miller (bass), Ben Langer (piano), Richard Vallejos (tech) and Tim Hughes (percussion). The Senior Center is open Monday through Friday, from 9 a.m. to 3 p.m. Transportation is provided for those who need it. For more information on the Center, call 845-265-3952. 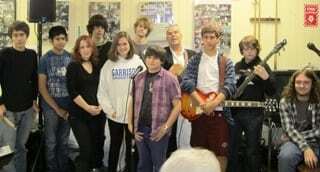 One Response to "Filling in the Generation Gap as Haldane Musicians Entertain Seniors at Cedar Street Center"
I wish I could have been there! It sounds like it was a wonderful event. Hopefully more things like this will happen in our wonderful town.